The Key Largo Coral Reef is vital to the entire eco system of the Keys. The reef is the third largest reef in the world and the only living reef in the US. Stretching the length of Key Largo and beyond the reef provides protection for the Island and provides a habitat for marine wildlife. 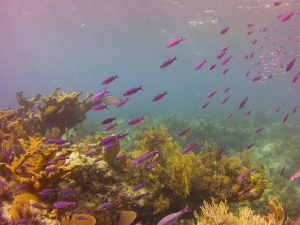 We have over 500 species of fish on the reefs of the keys. We provide a brief to all of our visiting divers and snorkelers prior to thier dives/snorkel on the reef. We provide reef friendly Sunscreen and Leave in hair Conditioner on our boats Free Of Charge these products are also for sale in our shop for visitors to take with them. Both of these products are supplied by StreamtoSea. 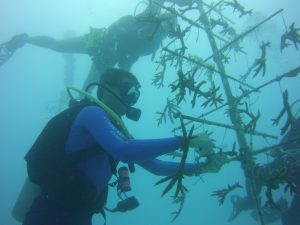 Working with the Coral Restoration Foundation we assist in taking the teams to the Coral nurseries. See the more Coral Restoration photographs. When you dive the reefs respect nature and take nothin but photographs, leave nothin but bubbles! Control your buoyancy and do not touch the fragile reef. You can help even when you are not visiting the Keys! Remember that everything that you use that is not consumed will have to end up somewhere. We can no longer simply throw something away and forget about it. Consider the need for using straws and single use plastic and avoid these where possible.